The Lawn and Entrance Plaza at the Main Street entry to the City-County Building sees hundreds of users daily as staff and citizens access the courts, city and county services, and utilize the lawn to socialize, walk dogs, and relax. While maintenance and some minor changes have occurred over the years, the last major update for this high-traffic area was in 1991 and many elements remain original to the building’s construction. With nearly 30 years of wear from the elements and several million users, portions of the hardscape are in need of overhaul. In the photo at right you can see the bricks on the edges of the steps are coming dislodged creating an uneven surface on the steps. This is just one example of the issues which have been noted in this area. The current project will execute two tasks to begin addressing these issues. Task 1 (blue area in the plan below) will renovate the ADA ramp which provides access between the plaza to the park. Task 2 will remove the existing brick steps around much of the park’s perimeter. New concrete steps and landings will be installed (green areas in the plan below) in targeted higher traffic locations. 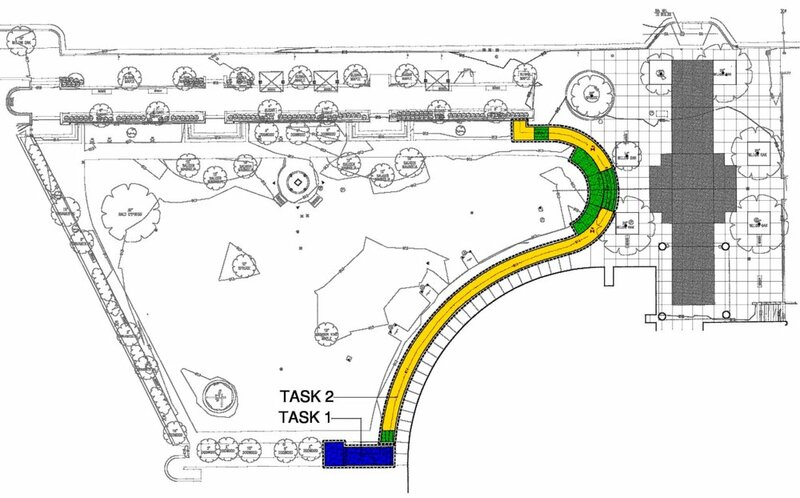 The remainder of the former steps (yellow areas in the plan below) will be converted into landscape beds to add to the park’s natural offerings and beauty.